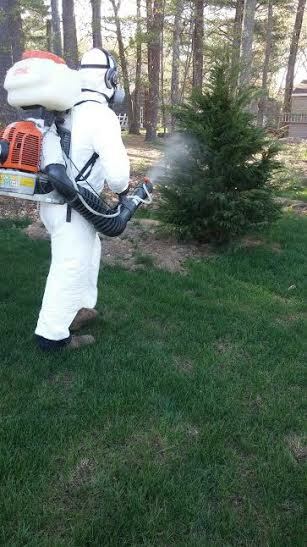 Our tree spraying services will help eliminate insects and pests that spread diseases throughout your tree. Some companies use tree trunk injections, but this method is nowhere near as effective as tree spraying! Depending on how big the tree is, our equipment will vary; sometimes we have a small backpack sprayer, and other times we have a 1000 gallon tank trunk! Preventative tree spray, is our attempt to stop a pest or insect from spreading a disease; so we will spray the tree, before the pest or disease spreads and eats away at your tree. Diseases and insect pests can be controlled with our preventative spray. Curative spray is applied after an insect or a disease has hit your tree; this will stop the pest from causing too much damage to your tree or shrubs. We will be able to tell you which tree or shrub has an insect invasion that is causing disease and damage. "In addition to my weekly lawn moving I signed up for Tick and Mosquito control this summer. My husband, kids, and dog have never been more relaxed sitting on our back deck! No ticks on our dog and no mosquitoes on us! I highly recommend any bug or lawn services!"